Turn Austin into a giant game board with this fun scavenger hunt adventure. 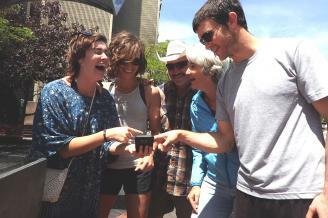 Combine the excitement of the Amazing Race with a three-hour city tour. Guided from any smart phone, teams make their way among well known and overlooked gems of the city, solving clues and completing challenges while learning local history. Two great adventures to choose from: Downtown Austin or Austin Trails. The Downtown adventure will start near the Capitol building and will take you on a journey among the monuments, down Congress Avenue and to some great spots on 6th Street. The adventure continues among food carts, famous hotels and interesting monuments to end at Lady Bird Lake. The Austin Trails adventure starts near the Bat Bridge and takes you along Ladybird Lake to discover famous monuments, tributes to Austin musicians, hidden art and great natural views. Play anytime during daylight hours. Start when you want and play at your pace. Save 20%. Only $39.20 for a team of 2-5 people after Promotion Code: AUSTINCVB. Sign up online at www.UrbanAdventureQuest.com.